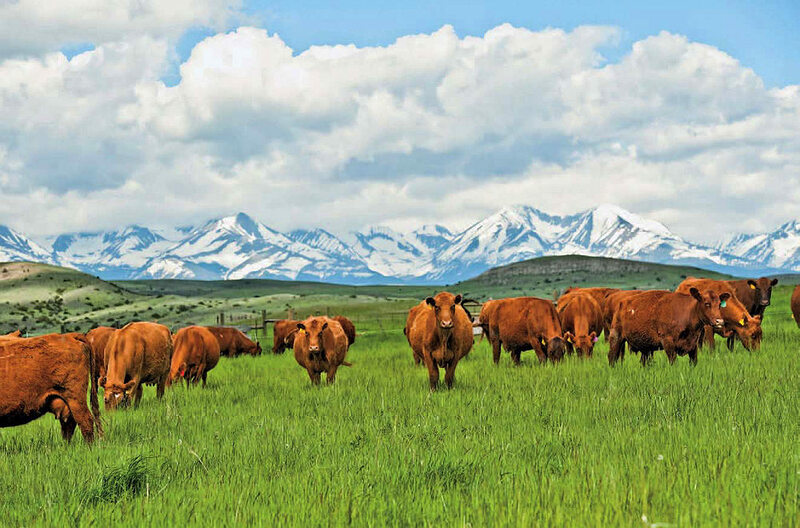 …while their herd of Red Angus cattle grazes with the Crazy Mountains as a distant backdrop. …an orchard along Otter Creek. Three weeks before calving season at Keewaydin Ranch, two ranch hands yell and swat at the cows—“Hey! C’mon. Git. Git in there!”—ushering them out of a corral and into a squeeze shoot. The metal compartment holds the 1,200-pound creatures still enough for Alex Blake ’96 and his father, Francis Blake ’61, to inject a vaccination and mineral supplement. “They just don’t naturally like going into confined spaces, even though they’ve all been through here before,” says Alex, as one red Angus mother-to-be moos and grunts and kicks the bars, making a clanging racket. Alex pats the cow’s auburn coat and pulls the lever to set her free. She trots past the wooden fence toward the pasture on the far side of the barn, where lush grass grows. Their spread is six miles from Big Timber, Montana, a town of 1,700 residents. 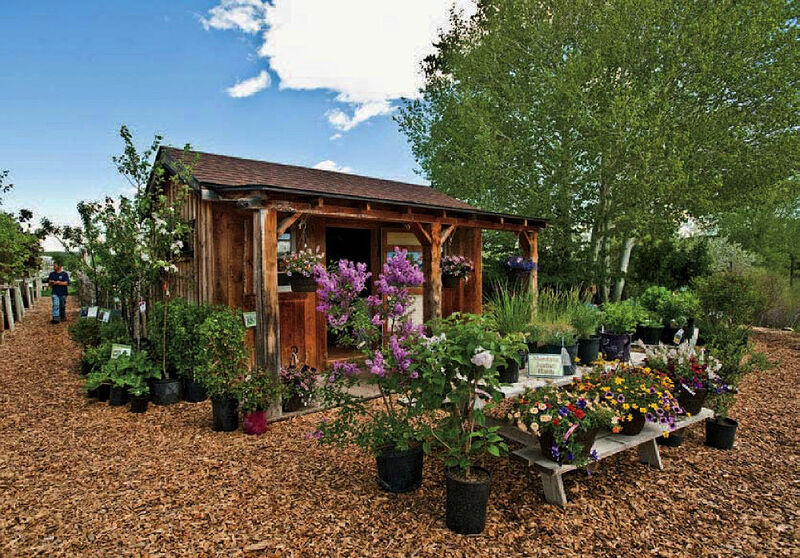 It lies in the valley between Billings and Bozeman, within a 90-minute drive from the northern entrance to Yellowstone National Park. 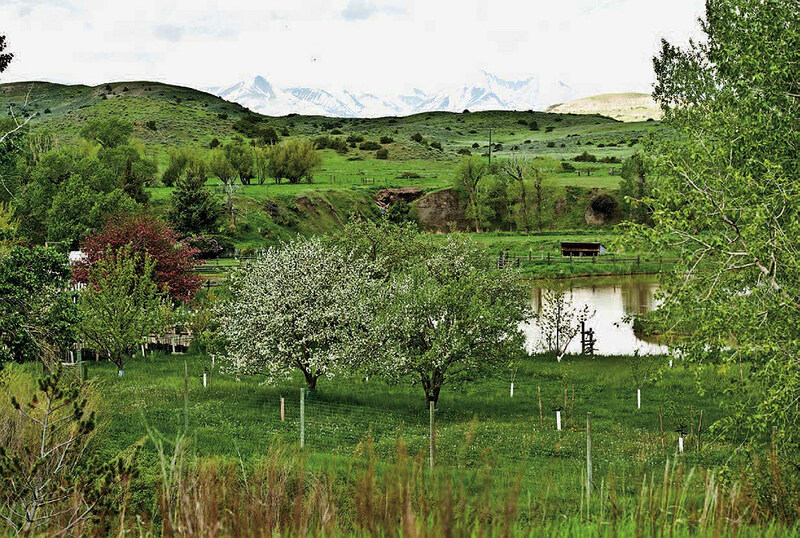 On a clear day, there’s a 50-mile panoramic view from the Blakes’ yard across prairie- and rangelands, from the ultra-craggy “Crazies” to the Absaroka and Beartooth Mountains. “It was a patch of dirt when we arrived,” Francis recalls. “An unbelievable mess.” A few cottonwoods and willows lent scant shade; the surrounding grounds and riparian zones on Otter Creek, about 75 yards from the house, had been denuded by grazing cattle. Rusting wrecked cars lay about, although several had been put to use supporting a bridge over the creek and fortifying its banks against flooding. 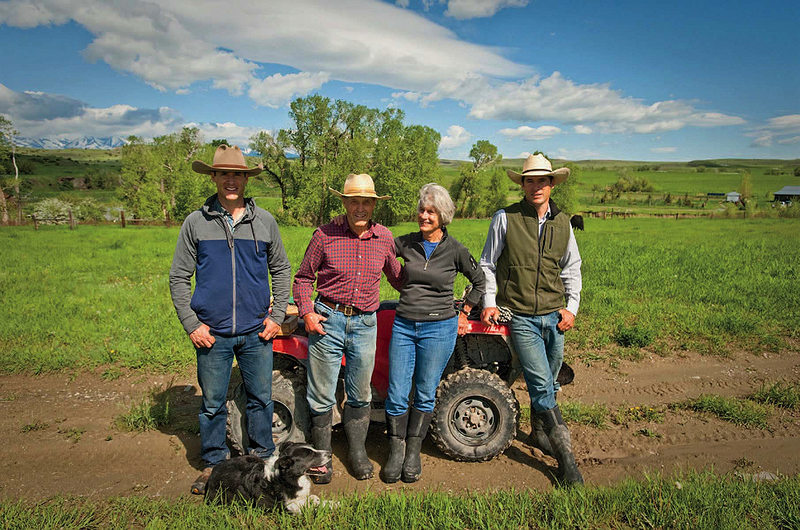 Big Timber was strictly a ranching community in the 1970s, and that is still a way of life for many, including other Harvardians in the area, such as Horatio Burns ’53 (father of Olympic rower Lindsay Burns Barbier ’87) and Jason Smith ’15, who manages his family’s Twin Forks Ranch. The town is still thriving by rural Montana standards, but today the local economy is also tied to a platinum mine and recreational tourism. Bozeman, a 75-minute drive, has become a booming tech hub: the downtown is packed with restaurants and boutiques, the airport has expanded, and real-estate development contributes to sprawl. After Harvard, where he studied economics and rowed varsity heavyweight crew (and captained senior year), Alex worked on family farms in Kenya, served four years in the U.S. Marines, seeing combat as an artillery officer in Iraq, and then earned an agricultural economics degree at Texas A&M. He returned to Montana in 2006 to manage operations at a natural-beef company before rejoining his family’s ventures and working for Western Sustainability Exchange, a nonprofit conservation organization focused on improving farming and ranching production practices. A view of the Crazy Mountains from the Blake Ranch. Francis and Alex Blake working on the fence on the ranch with Alex's dog Zac. Alex Blake and his dog Zac after fixing fence on the ranch. At 78, Francis doesn’t sit still for long. He’s racked up more than 13,000 miles on indoor rowing machines, like the one in his study (where his Harvard diploma and an etching of rowers on the Charles River hang: he rowed varsity lightweight); he also founded the Harvard Club of Montana and in 2005 received the College admissions office’s Hiram Hunn Award for his decades of schools and scholarships committee work across the state. A seasoned runner, he’s registered, with Amory, for the Devil’s Backbone, a 50-mile relay race in the Gallatin Mountain Range in July. Growing up in the then semi-rural Boston suburbs of Weston and Dover in a family whose Harvard roots date to the 1700s, Francis always liked working outdoors and on his grandparents’ dairy farms. His multi-talented great-grandfather, also named Francis Blake, was a scientist, inventor, and pioneering photographer. In the late 1800s he invented a carbon microphone, the Blake Transmitter, which made the telephone a viable instrument and became standard equipment for Bell Telephone. He also created the Keewaydin Estate in Weston, a Victorian home and gardens. “I had many good times there,” Francis adds. But after much of the land was taken for part of the Mass Pike and the Weston tolls interchange, his father and his siblings sold the place, and it was torn down. Francis bucked his family’s traditional naval service to join the marines after Harvard, then worked briefly in finance in New York City, where he and Sandi, a reporter for Life magazine, married. He, more than she, craved rural life, and they moved to the English Cotswolds: he earned a certificate from the Royal Agricultural College, and worked on a diversified farm, while she honed gardening skills, and bore Peter. Returning to the United States, they touched down for Alex to be born in Boston, then headed to Big Timber, where they could afford to buy land and a small herd. They fixed up the house enough to live in, carted away the junked vehicles, and Francis fenced off the creek, funneling the cows to water gaps instead, to help restore riparian growth. 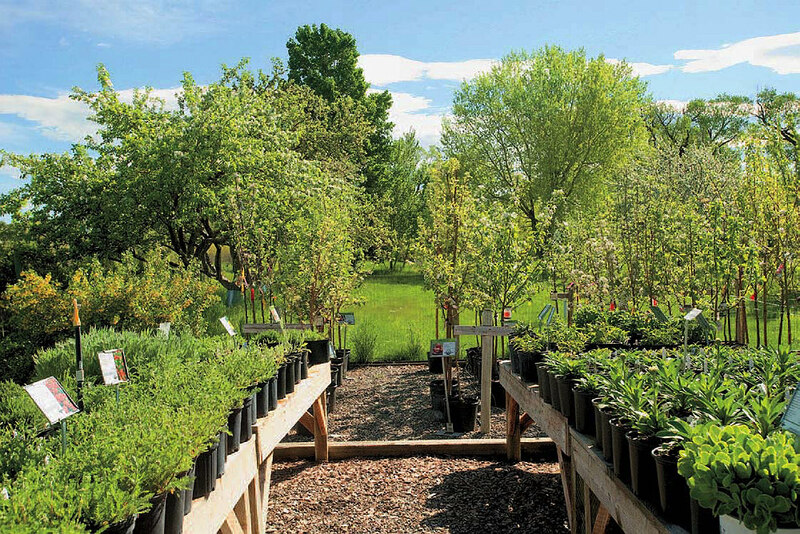 They also began naturally enriching the topsoil there and in abutting pastures (they avoid synthetic fertilizers and use only minimal herbicides), and have, over the decades, planted at least a hundred trees and shrubs, along with countless other native plants and grasses. The creek banks are now a verdant habitat for herons and migrating pelicans, beavers, and sometimes otters. The Blakes have always sought to employ simple, sustainable practices, including low-mechanized operations and solar power. One key move, made soon after Alex returned, was to calve not, per tradition, in February and March, but in May and June, when pregnant cows can feed on spring grass instead of expensive winterfeed that adds to their carbon footprint. The off-cycle practice also generates more profit: the calves typically go on sale in January, when fewer animals are available to meet the demands of the winter or early spring commodities market. But on a sunny day, the sky blue for as far as anyone could see, as Alex rode by on his horse, herding the cows out of a pasture by the nursery, over the creek bridge that was once held up by a pile of cars, and off on a two-mile trek to fresh grazing grounds, it was hard to imagine the Blakes’ homestead as anything but blissful.